I’ve spent this weekend down at the shore and have loved every moment of it. I’m one of those people who craves the beach every few weeks, so this little escape was just what I needed to reenergize. On the way down in the car on Friday night I managed to enjoy an amazing dessert from Connie. But first, a flashback. Two and a half years ago, Connie and I flew to England and Paris for a week. It was an incredible six days filled with museums, walking, strange subways, overpriced souvenirs, and Topshop. Connie’s aunt and uncle lived in Essex, and they took the Tube in our first night to take us to a traditional Chinese restaurant. I had never had authentic Chinese food, and I was in heaven. The whole wheat vermicelli noodles crispy from the pan, the steamed dumplings, the taro, everything was just gorgeous. Then, the next day, we all went and had dim sum, another first for me. 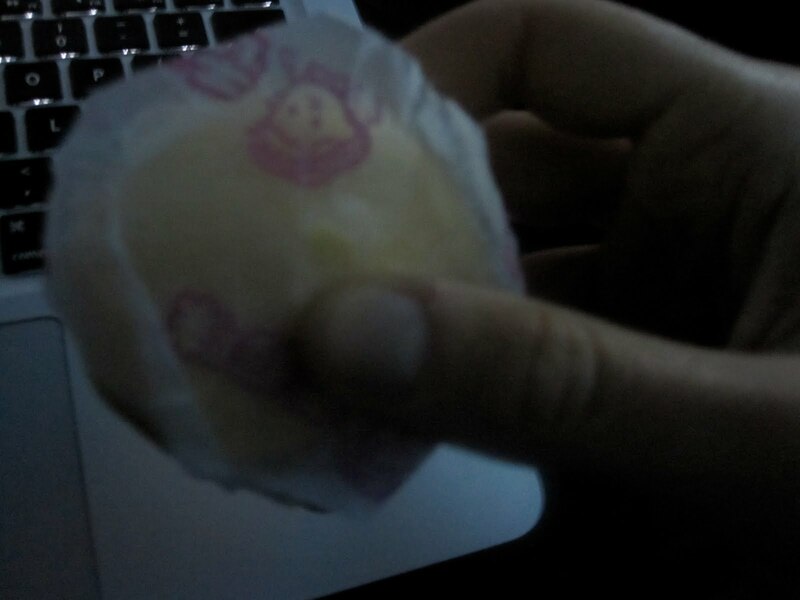 The ending of the meal was my favorite when they brought out ni huang bao, steamed buns filled with custard. Connie and I maybe ate about twenty of them. Ever since then, we’ve been trying to find an equivalent in America. We’ve found them once or twice, and Connie’s mother made them for me for Thanksgiving. This week, she made them again, and Connie took them to me as a present. I ate one on the way down. When you bite into the bun, you’re faced with a chewy and creamy center of custard delights. It blows my mind every time, and I love Connie’s mom for making them! My Fourth of July celebration was simple and elegant. I had a turkey burger wrapped in lettuce, some of my mom’s olive oil potato salad, 1.5 ears of steamed corn on the cob, and a couple bites of my dad’s bratwurst. It was surprisingly similar to the sausage links they used to make us in school on Breakfast Day. I’d love to slather some maple syrup on that thing! Today I woke up and knew I couldn’t work out before leaving the beach, so I slept slightly later and enjoyed a yogurt bowl with banana, 1 GIGANTIC plum (biggest plum I’ve ever seen in my life, and it was amazing! ), Light N Fit strawberry yogurt, and Total Raisin Bran. Halfway through my trip home I ate a snack of a Quaker Granola bar. 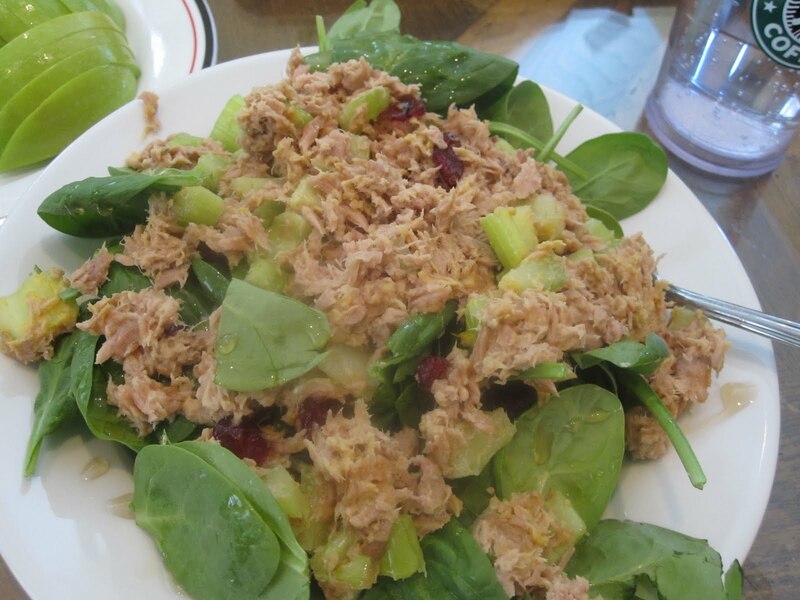 on top of a bed of baby spinach I combined 2 servings of white chunk tuna, chopped celery, 1tbsp Craisins, 1tbsp lite mayo, and a splash of mustard. I dressed the salad with champagne vinegar and a bit of agave. 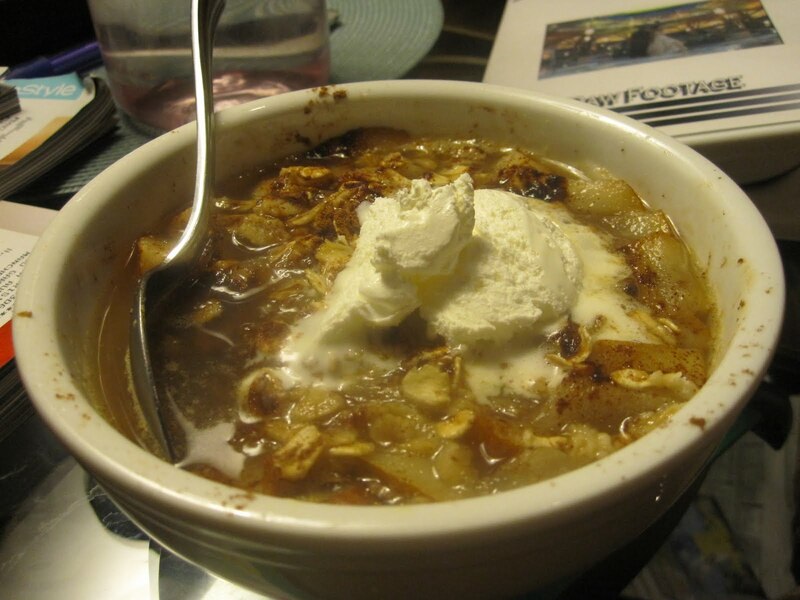 Paired with a serving of Popchips and a chopped up Granny Smith. 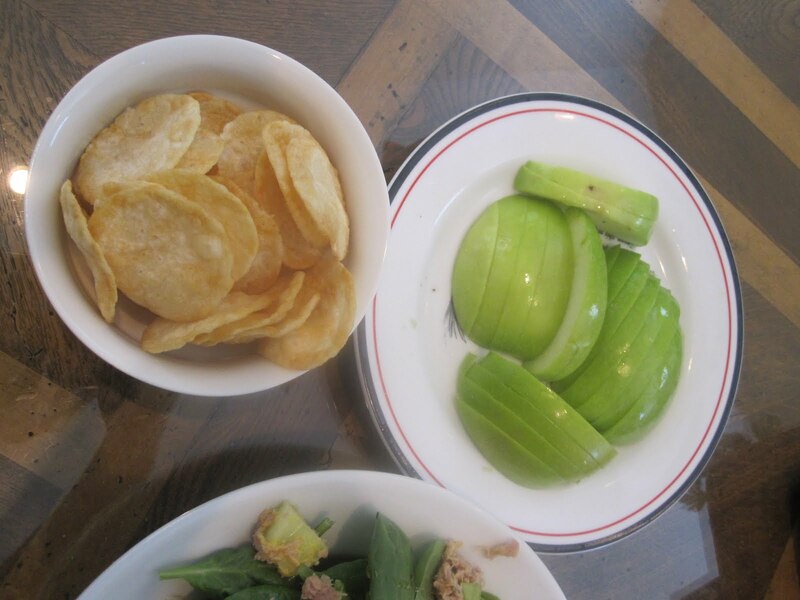 I LOVE Popchips, they’re so light but retain that potato chip flavor. All together a pretty good lunch! After laying outside reading magazines for about an hour, I came back in after realizing I was starting to get worn out. 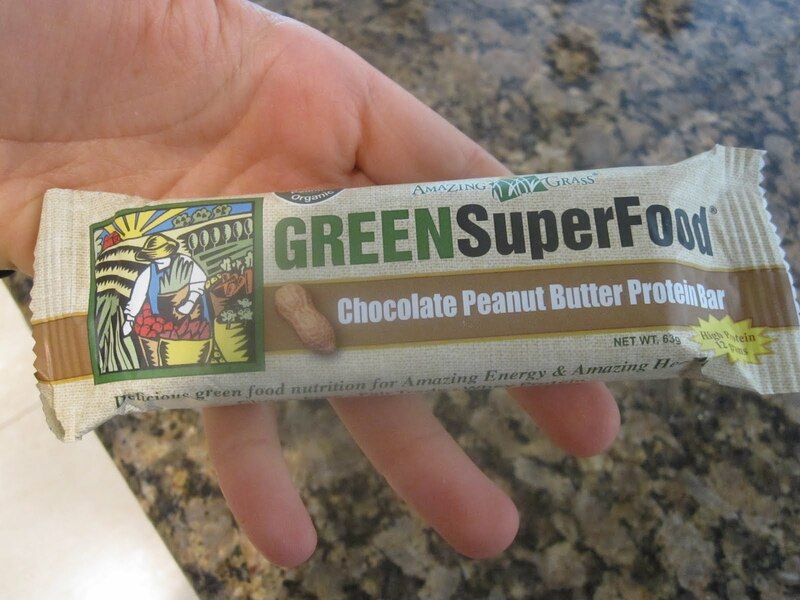 At 4 I cracked into a new bar, the Green Superfood Protein Bar in Chocolate Peanut Butter. The inside of this bar freaked me out. Woah. That is intense. 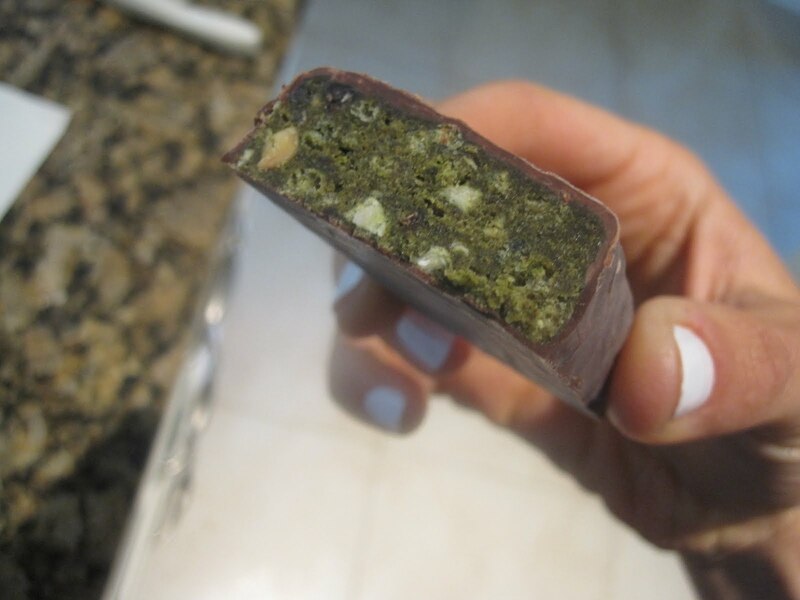 I’ve never eaten a bar with green on the inside! I cut it in half because this is a pretty calorically dense bar (270 cals) and I didn’t want to be too full on my run. I ended up halving it and eating it with a plum. The taste was just okay. It kind of tasted like spinach with peanut butter and chocolate on it. Weird!! All in all I’ll finish the rest of the bar tomorrow morning as my mid-morning snack but I don’t think I’ll be purchasing it again. It definitely did not hold me over for my run. Speaking of which! I tried to go on a run today. In 100 degree heat. At 5 PM. Not one of my finer moments. I ended up cutting it about a mile short and walking up the final hill, dripping with sweat and dizzy with thirst. Next time I should know to just stay inside! I ended up doing 3 miles in around 33 minutes. I was quite the sight when I came back to the house! The funny thing was, my legs felt great afterwards, and this was my first outside run in about a week! I was just totally worn out. After about twenty minutes of rest and drinking a lot of water, I felt much better. So I did about 15 minutes on the elliptical as well and called it a day. By this point, I was exhausted and starving, and I HATE it when I get like that. I try to do everything in my power to avoid over-hunger. Add to that the fact that my tummy just wanted something simple, and I was fit to be tied. 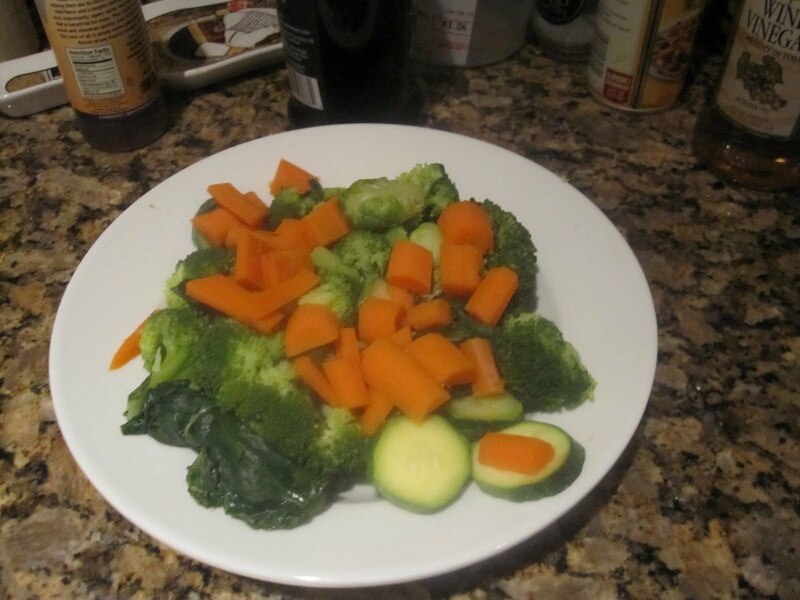 So I threw a large amount of mixed vegetables into a steamer bag (broccoli, squash, carrot, and spinach) and let it steam for about five minutes. 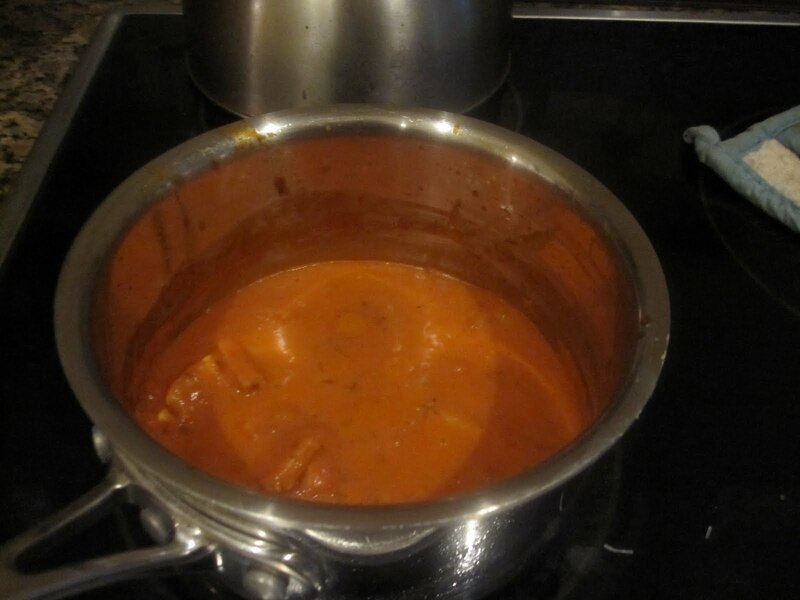 Then I set about making my sauce. 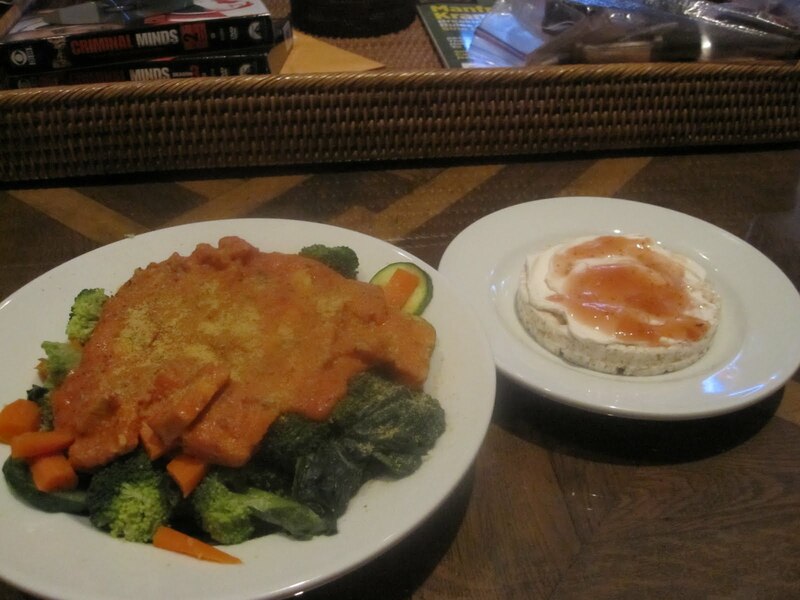 I heated up 1.5 servings of Geno Auriemma Basil Marinara sauce and added 1.5 tbsps of Tofutti Better Than Cream Cheese to create a creamy pink marinara, and then dropped in 1/4 block of tempeh. I dumped the sauce on top! I sprinkled some nutritional yeast on top and paired it with a rice cake topped with more cream cheese and strawberry-apple-rhubarb jam. 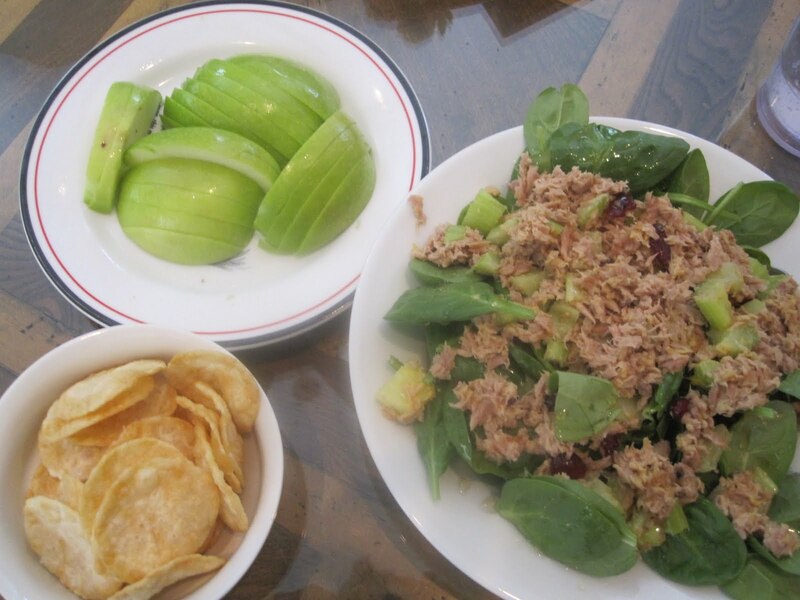 Such a great, simple dinner. But I was still hungry afterwards. So I just enjoyed a Lindt Intense Orange square! So happy these are back in my life.